“Sittin’ in the Dark.” Words by Harold Adamson, music by Jesse Greer (1933). Recorded by Sam Browne and Elsie Carlisle on March 3, 1933. Decca F. 3504 mx. GB5631-2. and so on. Most commonly the words are delivered by a male singer playing a young man who has somehow arranged to “sit in the dark” with his girlfriend while her parents sleep upstairs. 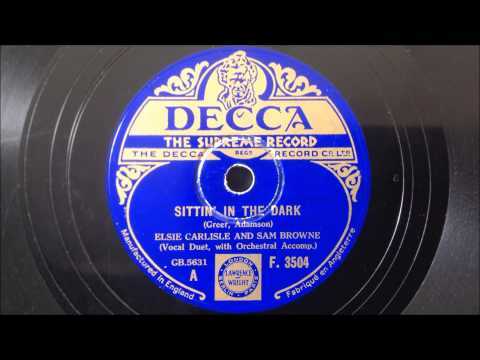 In this March 3, 1933 duet between Sam Browne and Elsie Carlisle, however, the measured pace of the piece is set by both boy and girl as they “sit and sigh” and do what lovers do (“Dee-doo-dee-doo-dee-doo!”). The musical director made the clever choice to record the song as a little drama introduced by Elsie’s “pop,” who bids the “kids” goodnight, seems to be snoring later, and even interrupts the lovers, asking grumpily, “What, you still here? I’m getting fed up with this! What are you doing down there, anyway?” Sam Browne and Elsie Carlisle’s characters are actually referred to or addressed as “Sam” and “Elsie,” which makes the fictional romance between the two youthful celebrities somehow seem more immediate. Elsie speaks and sings in an intermittently odd voice, which may in fact be a failed, but exceedingly cute, attempt at sounding American. I do not, however, mean to suggest that she could be trying to sound like American Louis Armstrong, who first recorded “Sittin’ in the Dark” in late January, 1933 in his own unique style (for an insightful discussion of that version, see the essay by Ricky Riccardi on The Wonderful World of Louis Armstrong). Armstrong’s is the only American recording I have run across, but the song was recorded quite a lot in 1933 in Britain, where there were versions by Bidgood’s Broadcasters (as “The Harvard Dance Club Aces,” with vocals by Tom Barratt and Phyllis Robins), the BBC Dance Orchestra (under the direction of Henry Hall, with Sam Browne as vocalist, in a Van Phillips arrangement), Harry Roy and His Orchestra (with vocals by Bill Currie and Harry Roy), and Jack Jackson and His Orchestra (Al Bowlly, vocalist). Only two days before Sam Browne and Elsie Carlisle recorded their Decca version of the song, Sam had done a duet for Regal Zonophone with either Billie Lockwood or Anona Winn (the woman’s identity is unclear, as this is one of the many Zonophone and Regal Zonophone records attributed simply to “Jack and Jill”). Sam and Elsie themselves would do another version only days later with Rudy Starita and His Band. As the weeks progressed, there were more recordings of “Sittin’ in the Dark” by Jack Hylton and His Orchestra (with vocalist Pat O’Malley, in a Peter Yorke arrangement), Jimmy Campbell and His Paramount Band (with Tom Barratt & Phyllis Robins), Pete Lowe and the “Scottish Daily Express” Band, and Jay Wilbur and His Band (in a medley with vocals by the Jackson Harmony Trio). The songwriters of “Sittin’ in the Dark” are comparatively obscure, although Harold Adamson would contribute to some notable lyrics for movies and television in the 1950s, such as “When Love Goes Wrong (Nothing Goes Right)” in the Marilyn Monroe musical comedy Gentlemen Prefer Blondes and the theme song to I Love Lucy (whose words are admittedly seldom ever heard).